I suppose it was only a matter of time, but seeing the League's ranks swell to once again include a large collection of B-List characters is somewhat disheartening. 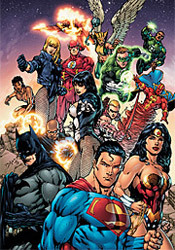 When Grant Morrison launched JLA a decade ago with the goal of returning the team to its glory days, the first matter of business was limiting the roster to the publisher's big guns. Today, the shortcomings of that format are a bit more obvious – it's tough to coordinate a monthly team-based book with dozens of ongoing solo titles without treading water and losing a great amount of pertinence. But while there wasn't a lot of room for serious change from within in the old format, I found it hard to get excited about the new adventures of Vixen, Black Lightning, Hawkgirl and Red Arrow. While they're balanced to an extent by the presence of Green Lantern, Batman and the Flash, the real focus of the storytelling is on these lesser-known characters, and that's disappointing. To his credit, author Dwayne McDuffie tries to make the best of the situation. The time he spends with many of these also-rans reveals a good collection of distinct personalities, although there isn't a lot of conflict brewing from within the team's ranks. While it's nice that this diverse group is so chummy and content, constantly kidding around with each other, in the end that also makes them quite vanilla. It may be the DC way for their premiere super team to constantly share warm handshakes and smiles, which they seem to do this month for more pages than they spend confronting their enemies, but that's not what I'd call entertaining reading. An entire platoon of artists have dogpiled on this month's issue, including but not necessarily limited to Ed Benes, Doug Mahnke, Darick Robertson, Rob Stull, Ian Churchill and Ivan Reis. While most of the illustrators have similar styles that easily gel with one another, Robertson's distinctive technique is the exception. His thick lines, exaggerated expressions and sharp focus on contrast sticks out like a sore thumb, and while his work can be fantastic in the right circumstances, they don't include a straightforward superhero book. The former Transmetropolitan artist's duties are fairly brief, however, and the rest of the issue looks and feels just about right. Justice League of America #25 brings an awful lot of posturing and hot air, but it stops short of actually delivering much value. The team's confrontation with Kwaku results in a ten-page monologue so long winded, I barely made it through in one sitting. I'd expect some sort of resolution in a double-sized anniversary issue such as this one, but it spends so much time on dialog that I guess the conclusion will have to wait for another month. Skip it – despite a few solid character-driven conversations early on, this issue is inconsequential and tedious.